In February, I was interviewed by Larry Teague from Buckmasters GunHunter Magazine for a quick Q&A spotlight for their March 2016 issue. Here is one of my answers. Is it true you took your first muzzleloader deer with a flintlock? Yes. In Pennsylvania where I live and grew up, we have to use a flintlock during the muzzleloader season. I think I was probably 16 or 17 when I shot my first deer with a flinter. He was a wide 10-pointer with really short tines, an older deer going downhill. He was bigger when I first saw him the previous season. To read the full article, just click here or on the image to the right. 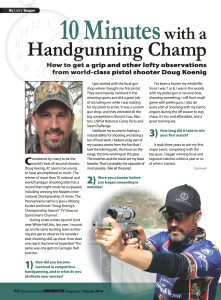 The article is reprinted from the March 2016 issue of GunHunter Magazine courtesy of Buckmasters LTD.